A diagram of the proposed CONNEX mission, which would generate artificial auroral displays to help researchers better understand the near-Earth space environment. Gian Luca Delzanno is a plasma physicist in the Theoretical division at Los Alamos National Laboratory. He is co-author of the paper "Assessing the future of space-based experiments," Eos, 99, 18 June 2018. The CONNEX team includes members from Los Alamos, NASA's Goddard Space Flight Center, Space Science Institute, Planetary Science Institute, SRI International, SLAC, University of Michigan, University of New Hampshire, University of Colorado-Boulder, Princeton Plasma Physics Laboratory, University of Iowa, and University of Calgary. Delzanno contributed this article to Space.com's Expert Voices: Op-Ed & Insights. Fifty-six years ago, a nuclear device called Starfish Prime was detonated 250 miles (400 kilometers) above Earth. With a yield of approximately 1.4 megatons, the explosion released massive amounts of energetic fission debris into space. One of the outcomes was the creation of an artificial radiation belt, much more intense than that typical of the natural Van Allen belts, which lasted for years. High-altitude nuclear tests like Starfish were the first active experiments in space — that is, experiments that deliberately perturb the space environment. Despite the destruction, the nuclear tests helped scientists learn an enormous amount about the near-Earth environment that had previously been a mystery. Fortunately, nuclear weapons are no longer tested in space, thanks to international treaties. But we have also seen a steep decline in recent years in the number of other active space-based experiments, hindering our understanding of the dynamics of the near-Earth environment and limiting our ability to protect our satellites and our astronauts from high-radiation exposure. Because space has no atmosphere to filter out radiation, anything in orbit is at higher risk. Each year, the government and private companies spend millions of dollars to harden spacecraft to mitigate their vulnerability to the harsh space environment, such as that of the Van Allen belts, particularly during times of enhanced geomagnetic activity arising from the sun. This makes spacecraft heavier, decreasing their functionality. More weight also requires more fuel to launch and, consequently, increases costs. If we can better understand the environment where these spacecraft orbit and improve our ability to forecast harmful conditions, we can find better and more cost-effective ways to protect them. Active space-based experiments began early in the space age, when little was known about the near-Earth environment, and focused on very fundamental aspects of the space environment and its interaction with spacecraft. Over several decades, active space-based experiments looked at not only nuclear explosions, but also at charged-particle beams, heaters, chemical releases, water dumps, plasma plumes, tethers, antennas, and voltage biases — all resulting in a better understanding of plasma and space physics. Since then, however, space-based active experiments have become less popular for multiple reasons. First, prior experiments have collected most of the more easily obtained data — so the low-hanging fruit has already been picked. Gathering additional meaningful data requires more sophisticated experiments. Plus, space experiments became victims of their own success (and of that of space physics in general): the more space scientists learned about the space environment, the less they needed exploration with active experiments. But the need for more space-based active experiments has not diminished. In fact, just the opposite. In 1968, the United States launched a total of 61 payloads. In 2017, that number was 255. Add to that payloads being launched by countries such as Russia, China, India, and others, as well as the private sector, it is clear that better understanding the space environment — and its potential impact on our spacecraft, both manned and unmanned — is increasingly important. We have reason to be optimistic. Diagnostics (the key to any experiment) have improved tremendously over the years, making our data-gathering capabilities much better. In addition, several new technologies are reaching maturation, opening up a host of opportunities for new exploration. Conducting active space-based experiments with these improved technologies will allow us to probe deeper and expand our understanding beyond the data we collected before. One such experiment that we are developing is called CONNEX, short for "CONNection EXplorer." The goal of CONNEX is to connect phenomena that happen in the space environment far from Earth (in the magnetosphere) with those happening close to it (in the ionosphere), particularly during geomagnetically active times where the near-Earth space environment is very disturbed. Currently, we cannot establish accurate magnetosphere-ionosphere connections, which is holding back magnetospheric research. For example, we know that the aurora borealis is created when charged particles strike atoms in the ionosphere, causing electrons in the atoms to change their energy state and release light. However, despite decades of research, we do not know the magnetospheric processes and conditions that produce the wide variety of auroral displays. In turn, this also prevents us from using the auroral ionosphere as a "TV screen" to watch magnetospheric activity. This experiment could help answer that question. CONNEX is a small satellite constellation comprising a "mother" spacecraft and some smaller data-gathering spacecraft that will orbit about 31,000 miles (50,000 km) above Earth. The mother spacecraft is equipped with an electron accelerator emitting a relativistic electron beam that can reach all the way to the atmosphere, where it will create an artificial aurora borealis. As it does that, ground-based instruments will take measurements of this manufactured aurora and of the local ionospheric environment, while the small CONNEX satellites will take measurements of the magnetosphere at the same time. 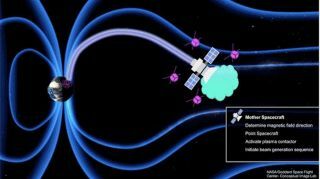 This will help us better understand how the space environment behaves and, more generally, how better to protect our spacecraft from malfunction as a result of geomagnetic storms and sub-storms. Los Alamos National Laboratory has been developing this experiment for the last 15 years — but it kept stalling because the general idea and the underlying technology were not mature enough. Now it is (thanks also to important investments from the Los Alamos Laboratory Directed Research and Development program), and we feel confident that CONNEX will provide critical data about the near-Earth environment. But CONNEX is only one example of an active space-based experiment that can deliver crucial insight into the space environment that has become increasingly vital to national security and the global economy. Many other experiments are being developed by research institutions all around the globe. We should seize the opportunity new technology provides us to pursue them and contribute to a healthy portfolio of space research activities (including Earth-based laboratory experiments) to learn how to predict the space environment's behavior — and how to better protect our spacecraft.